Bantam: : any of numerous small domestic fowls that are often miniatures of members of the standard breeds. Evil doers, bloodcurdling, death pits, slave empire, blood-crazed count. And this is just the back cover. Sometimes it’s difficult to take a novel more seriously than its author. But Lester Dent sets the bar pretty low. Dent once described his work as “churning out reams and reams of sellable crap.” No illusions of literary greatness there from the man who penned the original Doc Savage series in the 1930s and 40s under the name Ken Robeson. Crap, but enjoyably reading nonetheless. In a time before TV, reading was still a popular form of entertainment, and Dent wrote for Street & Smith Publications, which was essentially a printing company that needed content to market on the heels of its successful The Shadow stories. 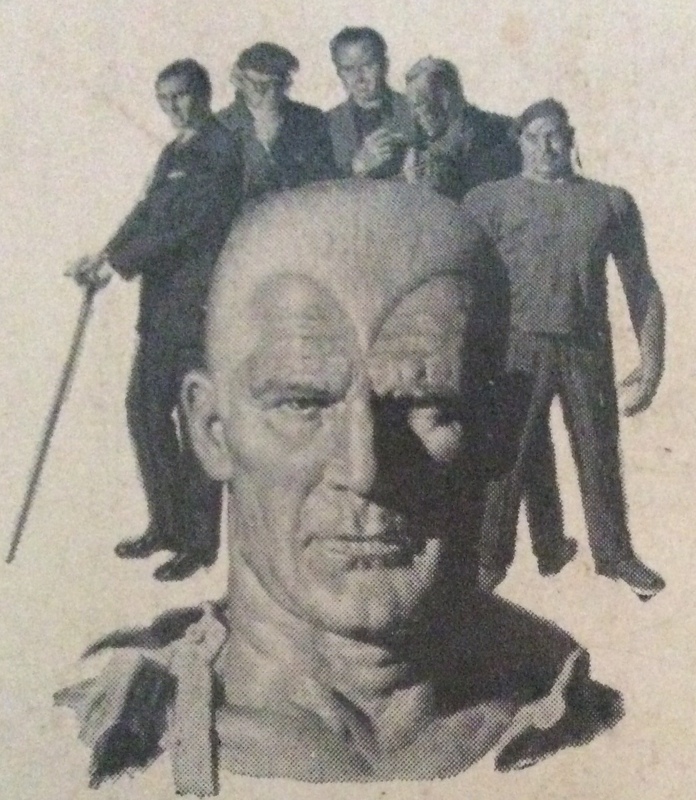 Thus was born Doc Savage Magazine, a periodical that in every issue contained about three action-packed novels wrapped inside a cover featuring Doc in a ripped shirt. The books featured Doc — the man of Bronze, an Indiana Jones character with the gadgets, but not costume, of Batman — and his five Great War (what they called World War I before they were aware of the sequel) veterans traveling across the globe solving mysteries and helping people in distress. My interest in Doc Savage started about a year ago. I was visiting family in the town where I spent my junior high and high school years, and to kill time we took a nostalgic visit to the Source Bookstore. Growing up, I was a regular at the downtown shop, buying used paperbacks to fill the holes in my Mack Bolan and Remo Williams collections and picking up the odd Kurt Vonegut and Robert Lynn Asprin. During last year’s visit, we were mainly looking for books for the kids — tomes with animals, architecture, fun stuff at good prices. To round out the stack of purchases, I dug around in the back shelves, which are lined with serial novels and sci-film, television and movie adaptations, and picked out Dent’s (Robeson’s) “Resurrection Day.” It was a used 1960-70’s Bantam Books re-issue with James Bama’s widow-peaked, muscle-bound version of Doc on the cover. When it first came out, Doc Savage Magazine’s cover price was 10 cents an issue. Bantam’s single-story paperback reprints were 50 cents back in the day, up to $5 on the Source shelves. Still a good price. After devouring Resurrection Day, I ordered a few more Docs on eBay. Aside from the adventure stories, I get a kick out of the historical references and dated futuristic predictions in the pieces. The crew always has some before-it’s-time crime fighting tech, like night vision goggles, portable alarms and a dust that uncovers recent footprints by reacting to vibrations in the ground. Doc followed by his five-member crew. — Air travel. Doc’s fleet includes a large Spruce Goose style airplane packed with all the equipment he may need, and he even owns a state-of-the-art auto-gyro helicopter. But air ships still plays a big role in some of the stories. — Communications. Much is made of the team’s ability to make long distance calls on the desk phones during investigations. There is also a nation-wide hook-up to make announcements over every radio station at once, and newspapers have morning and afternoon editions. —- Mercy me. You can’t have a great pulp action novel without a few gunfights, but Doc and his crew opt for the less-lethal route. They pack “super firer” machine pistols that spit out “mercy bullets” that knock out opponents. The guns also fire exploding bullets when they need to break things. Hypodermic needles filled with miracle sedatives and sleep gas spewing grenades round out the arsenal. Most of the death in the books comes from the bad guys killing each other or getting caught up in their own traps. Punishment of captured criminals involves a trip to crime college where they are deprogrammed to resist criminal impulses and have their memories wiped so they can start anew as productive citizens. The word “lobotomy” doesn’t appear in the books. An archaeologist/geologist. Ok, you’ll be going to exotic locales, sometimes exploring ruins, and there may be mummies involved at some point. I guess that makes sense. Also, Howard Carter had discovered King Tut’s tomb a mere 10 years earlier. An industrial chemist. Useful for the knockout weapons and high-tech crime-fighting stuff. An electrician. Why not? See chemist above. Today’s equivalent would be the computer whiz/hacker character. An attorney. Did I mention the attorney has a sword cane? With a blade dripping of non-lethal knockout poison. — Super man. Doc has genius-level intelligence and great strength, and his real first name is Clark. And he has a fortress of solitude in the North Pole. And he calls it the “Fortress of Solitude.” Sounds like another hero who started making his rounds in the 1930s. At any rate, Doc and his polar retreat came first.